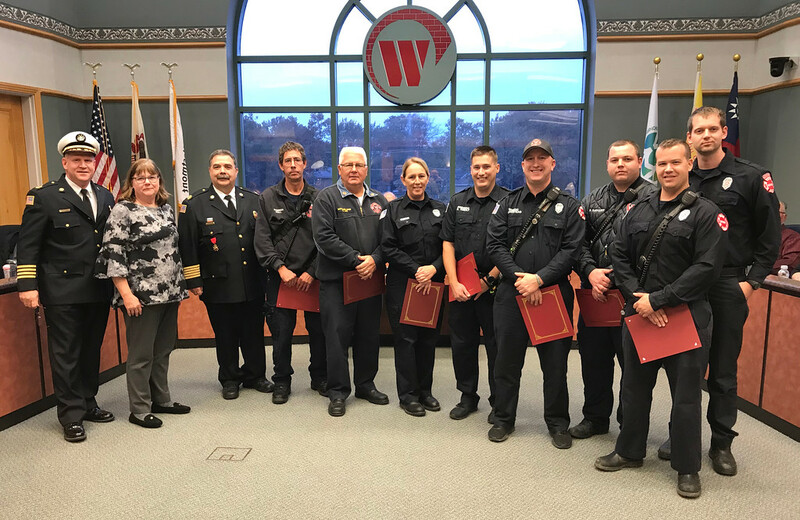 Westmont Fire Department personnel were recognized at the Village Board meeting on Thursday, October 25. There was a staff promotion, several life saving awards, and a presentation from the Fire Department to Mayor Gunter. Firefighter Chris Stoltman was promoted to the rank of Lieutenant. Stoltman has worked with the Westmont Fire Department for 16 years. Stoltman is also an assistant to the Quartermaster, which oversees personnel uniforms and fire gear. Five lifesaving awards were presented to Acting Officer Tim King, Firemedic Andrew Ledesma, Firemedic Ethan Luoma, Firemedic Zach Crawford, and Firemedic Grant Van Buren. On September 1, Westmont Fire Department personnel was dispatched to Oak Brook Hills Resort to treat three individuals who were struck by lightning. All three of the individuals survived the incident. Teamwork Commendation Awards were presented to Battalion Chief Carl Lite, Lieutenant Brian Murphy, Lieutenant Pat Owens, Firefighter Frank Dizonno, Firemedic Ryan Dubowski, Firemedic Stephanie Grimm, Firemedic Gary Hoffstead, Firefighter John Moll, Firemedic Evan Rhule, Firemedic Dale Tobolt, and Firemedic Richard Wauchope. On September 21, Westmont Fire Department responded to a structure fire. Upon arrival and inspection of the structure, an unconscious individual was found inside the building. Captain Joe Kielczynski forced entry into the room where the individual was found and safely rescued this person from the burning building. For his heroic effort, Kielczynski received a Lifesaving Award. Additionally, Teamwork Commendation Awards were presented to Firemedic Brad Benson, Firefighter Josh Boyajian, Firemedic Stephanie Grimm, Firemedic Jordan Kasper, Firemedic Tim King, Firemedic Adam Mobley, and Firemedic Chris Ziemianczyk. The Fire Department also presented an award from the Illinois Fire Sprinkler Coalition to Mayor Ron Gunter for following FEMA’s America’s Burning Report Guidelines. The guidelines provide recommendations for the protection of citizens and FEMA firefighters by adopting and preserving progressive residential fire sprinkler codes for single family homes following NFPA’s 13D standards.